What is the number 1 thing people can do to help protect the environment? What are the main advantages of native plants? What are the primary benefits of backyard conservation design and stewardship? Do children benefit from contact with nature? Name three of the canopy trees native to Pennsylvania. What is the first rule of gardening? What is needed for good natural habitat? What is the main difference between native and traditional gardens? 1. What is the number 1 stewardship activity people can do in their own yard to help protect the environment? Answer: Reduce the size of your lawn by at least 25%. Converting your lawn to a mixed landscape can save water and energy, while reducing yard waste and the need for fertilizers and herbicides. Reduced water consumption - according to the EPA, 30 to 60% of urban fresh water is used to water lawns each year. Turf requires two to three times the water of a sustainable mixed landscape. Reduction in air and noise pollution caused by gas mowers - lawns cover 20 million acres of residential land in the US, and lawnmowers account for 5% of the air pollution. A 3.5 hp lawnmower pollutes as much in one hour as an automobile driving 350 miles. What about the costs involved? If you hire a professional to design the landscape and install the plantings, it can be expensive to replace lawn areas. However, you can do the work yourself and use native species of plantings at little cost. A good place to start is with foundation, island and border plantings. They can be expanded in width and include ground covers, small;; trees, tiered shrubs, drought tolerant plants, and perennial flower beds. Soil depth of 12 - 18" is best for larger shrub plantings. 2. What are the main advantage of native plants? Native plants are species that are indigenous to a particular habitat within a specific bio-geographic region. They have specific characteristics that contribute to their success. Adapted to the region’s soil, hydrology, and climate. Evolved defenses to many diseases and insect pests. Create deep and extensive root systems, which help to stabilize the soil column and create an environment favorable to building fertile soils rich in organic matter. Absorb excess nutrients from runoff, enhancing infiltration during periods of heavy rain as well as drought. Provide habitat for butterflies, hummingbirds, songbirds, and beneficial insects. Ninety six percent of all birds live on insects. Their young cannot survive without them. Native plants living anywhere in the landscape play an important role in natural system services and ultimately the economy. Tallamy, Doug. 2007. Bringing Nature Home. Timber Press. 3. What are the benefits of backyard conservation design and stewardship (BCD)? Answer: BCD improves water quality, habitat and expands natural system services which is more resilient to climate change. Sustainable natural system services leads to a more sustainable quality of life, health, cost of living, sense of place and local economy. Both novice and professional gardeners are turning to native landscaping to reduce the cost of annual flowers, reduce maintenance and promote plant and wildlife conservation. Every backyard design should ensure the design is meaningful to the property owner, significantly enhances stewardship, is doable and fun. For example, in nature, water is managed by the elements from the first time it touches the surface of a leaf. It’s as though Mother Nature’s design of trees and shrubs as stormwater management devices. Your backyard design can include ways to provide natural system services that will infiltrate the maximum amount of rain to prevent flooding, stormwater and water pollution problems, while creating great habitat and beauty. They also enhance pollination. Homes adjacent to riparian areas, natural areas and parks should have native plants as part of an overall yard design to increase habitat and create green corridors, expanding natural system services. When we interconnect landscape patterns of riparian corridors and larger habitat areas, we expand habitat for resident and migrating birds. These areas can infiltrate rain when we create strategically-placed gardens to infiltrate rainwater. In this way, we can reduce or eliminate runoff and flooding. Fortunately, this is possible when we Design with Natives. It’s easier, less expensive, more beautiful, more fun and healthier in the long run than a traditional landscaping approach. There are real differences in this Designing with Natives approach, as native plants provide significant benefits over traditional gardens. 4. Do children benefit from more contact with nature? Answer: Definitely yes. Children and nature go together—or should. Recent studies document the importance of introducing children to the natural world, beginning in the early years. Their social, emotional, and physical health depends on this exposure to develop. Humans are hardwired to need nature—because we are part of it. In some communities, children lack access to nature and the freedom to explore local flora and fauna. How can children care about nature if they haven’t experienced it firsthand? Adults must do what they can to ensure that children have those opportunities. Dr. Frances Ming Kuo, a researcher documenting the positive link between nature and human health, and social and psychological functioning. Kou summarizes various research studies that show that humans benefit from exposure to green environments (parks, forests, gardens, etc.) and conversely, people with less access to green places report more medical symptoms and poorer health overall. Kuo uses the phrase “Vitamin G” (G for “green”) to capture nature’s role as a necessary ingredient for a healthy life. Evidence suggests that, like a vitamin, contact with nature and green environments is needed in frequent, regular doses. Supports creativity and problem solving. Studies of children in schoolyards found that children engage in more creative forms of play in the green areas. They also played more cooperatively (Bell and Dyment, 2006). Play in nature is especially important for developing capacities for creativity, problem-solving, and intellectual development (Kellert, 2005). Enhances cognitive abilities. Proximity to, views of, and daily exposure to natural settings increases children’s ability to focus and enhances cognitive abilities (Wells, 2000). Improves academic performance. Studies in the US show that schools that use outdoor classrooms and other forms of nature-based experiential education support significant student gains in social studies, science, language arts, and math. Students in outdoor science programs improved their science testing scores by 27% (American Institutes for Research, 2005). Improves nutrition. Children who grow their own food are more likely to eat fruits and vegetables (Bell & Dyment, 2008) and to show higher levels of knowledge about nutrition (Waliczek, & Zajicek, 2006). They are also more likely to continue healthy eating habits throughout their lives (Morris & Zidenberg-Cherr, 2002). Improves self-discipline. Access to green spaces, and even a view of green settings, enhances peace, selfcontrol and self-discipline within inner city youth, and particularly in girls (Taylor, Kuo and Sullivan, 2001). 5. Name three of the canopy trees native to Pennsylvania. The most canopy trees present before European settlement were primarily oaks, maples, hickory, Beach, White pine and Hemlock. The “Penn's Woods have supported people for thousands of years. Trees are essential to our lives. They act as living filters, cleaning the air we breathe and the water we drink. They help heat our homes and cool our streets. They provide us flooring, cabiets, medicines, maple syrup, paper and countless other products. They are sources of the inspiration and beauty that help define Pennsylvania. When early European settlers arrived in the state 400 years ago, almost all of the land was forested. Slowly, they cleared the land for agriculture and for fuel, housing and manufacturing. As the nation grew, the pace of land clearing quickened. By the early 1900s, nearly all of Pennsylvania's forest had been cut or burned. Careful management during the last century has restored much of the forest. About 134 native and 62 introduced tree species grow across Pennsylvania. Its range of topography and climate allows the Commonwealth to support the many different kinds of trees that make our forests unique and special. 1. Canopy - The canopy layer is more than 50 feet tall. The size of the canopy is key to many natural system services. Trees also provide carbon sequestration, cooling summer shade and fall colors. In winter tree bark and their silhouettes provide interest to the landscape. Evergreen trees act as windbreaks and help soften hard edges throughout the year. They also provide a background and contrast for flowering trees and shrubs. 2. Understory - Understory trees are usually 15-20 feet tall. These trees are often the showy ones like Fringe tree, Red bud or Sweet bay magnolia. One distinctive quality of understory trees is their shape. For example, a river birch is a V shape while a crab apple is round. 6. Name three shrubs native to Pennsylvania. Shrubs - Shrubs grow from 1 to 12 feet tall and also have a variety of shapes. Many have showy or fragrant flowers or fruits. Shrubs are best located around trees, used as foundation plantings or in beds or borders. Shrubs also provide a backdrop and contrast for colorful wildflowers. Shrubs are seldom planted alone in the middle of a yard. Mountain laurel is the state flower (shown below). Sweet pepper bush adds color in spring, Virginia sweet spire in early summer, ninebark in summer and Red chokeberry in fall. 7. Name three wildflowers native to Pennsylvania. Perennials - Perennials are 1-5 feet tall and add between 2 to 5 weeks of seasonal color. Plants like Blue flag iris, Jacobs’s ladder and Eastern blue star look great even when they are not in bloom. Coral bells have an interesting purple leaf that adds color in all seasons. Perennials are best displayed in clusters of six or more plants. Cardinal flower, great blue lobelia, Bee balm, coneflowers, Black-eyed Susan, and phlox all look best in clusters. Some flowers like Wild blue indigo can stand on their own. Certain garden styles, like cottage gardens, call for scattering or mixing perennials. These can sometimes create a messy, patchwork appearance and require some experimentation. 8. What is the first rule of gardening? Answer: Right plant, right place. Almost any plant will survive in your landscape if you plant it in the right place. You can drastically reduce the need for water, fertilizer, pesticides and pruning if you follow carefully select plants for the right site type conditions. 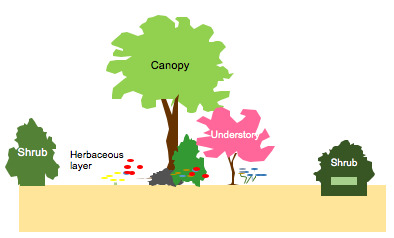 The basic site-types are sunny and moist, sunny and dry, shady and moist and shady and dry. Sunny means that the location receives at least 6 hours of sun. Make a note of the type of soil, sunlight exposure and water conditions of the planting site before you shop. Choose plants that thrive under the conditions you noted. 9. What is needed for good natural habitat? Answer: Increase canopy cover to 60% and have 60% native plants in your yard while creating habitat at multiple levels (canopy trees, understory trees, shrubs, flowers, groundcovers). When you begin to design your yard, try to copy what you see in nature. Plant trees and shrubs in groups instead of as isolated individuals. Whenever possible, layer vegetation and plant combinations of tall trees, smaller trees, shrubs, and herbaceous plants together. This is important because different types of wildlife will find food and cover at varying heights. Pay attention to your property borders and create a terracing of vegetation to emulate the edge effect found where forests meet fields. Plant corridors to connect islands of trees and shrubs with other natural areas. Large trees offer food, shade from the summer sun and nest sites for many birds and mammals. Many other plants, such as shrubs and vines, provide similar resources for different species. Although we often associate butterflies with wildflowers instead of woody plants, larval caterpillars feed on wildflowers and a number of woody species. For example, tiger swallowtail caterpillars feed on the leaves of cherry, willow and sassafras trees; and the spicebush swallowtail, true to its name, feeds on spicebush leaves. By providing a food source for the caterpillars on woody species , you will attract more butterflies to your flowers. 10. How much does a well-designed yard add to your real estate value? Research studies have shown that design sophistication and plant size are the landscape factors that most affect property value. Increasing “curb appeal” may also help differentiate a home in a subdivision where house styles are similar and thereby attract potential buyers. The change in value (from no landscape to well-landscaped) ranged from 5.5 percent to 11.4 percent in a study involving properties in 8 states. The increase in home value from the least valued landscape to the most valued landscape in a Michigan study was 12.7 percent. Thus, a home valued at $150,000 with no landscape (lawn only) could be worth $8,250 to $19,050 more with a sophisticated landscape including color and large plants. Interestingly, the multi-state study found that very minimal landscapes (simple design with small plants) detracted from the value of a landscape. The overall conclusion was that design sophistication was the highest ranked factor that added to the perceived value of a home. Thus, investing in plant material and good design principles will optimize the value of a home. In contrast to other home improvements that can deteriorate and age out, the value of an investment in landscape improvement increases over time since the growth and maturity of trees and shrubs enhance aesthetic appeal. Anything a homeowner does to the exterior of the home to improve its appearance has a positive impact on the home’s value, according to the experts with the Appraisal Institute. A Michigan university study found that homeowners achieved a 109% return on every landscaping dollar spent – higher than any other home improvement. By spending $500 to $3,000 on plants and materials, and a few hours of time, you can achieve a well-landscaped look without shelling out for professional help. The same university research found good landscape design – as judged by plant type, size and design sophistication – increased perceived home value by 5.5 –11% (Behe, et. al., 2005).